So, let’s say you’ve got a dysfunctional society and things have to change but nothing is forthcoming from the top. A charismatic leader turns up and convinces a lot of people to help him build a new order with or without the permission of the rulers. Enough people join in and coordinate their work so that things can be done the way everyone agrees they ought to be done and not how they are done. Eventually this comes to a point of confrontation with the rulers and, surprisingly, they clear out, leaving nothing behind. Your group fills this power vacuum and everything seems to be going great. Your charismatic leader has good political connections with the outside world, and you trust him to set things up right. You’ve had a peaceful revolution! Then, with no warning, an invading army appears and begins a march on the capital city. It seems that the departed rulers had other, better political connections than those of your leader, who backpedals and starts making secret deals with the invading forces. “Compromise is the only way to save our new society,” goes the explanation, “otherwise we’d be crushed”. Gradually, the compromises give back everything the revolution has gained, except that the new leader remains in power. This is approximately where the OLPC revolution now stands, when translated into a fable. And this fable has constantly been repeated in human history. Did anyone really believe that Microsoft would confine its opposition activity to disparaging commentary? 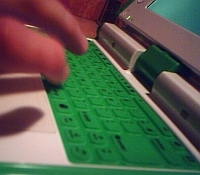 Any regional manager of theirs who did not work frantically behind the scenes to apply pressure on target governments to block acceptance of OLPC as originally designed would have found himself out of a job. Political analysis always comes down to an analysis of constituencies – those groupings whose consent must be secured before a plan can be acted upon. OLPC had at least two constituencies – the geek community that has been remarkably forthcoming with effort and resources to attain the desired goal, and the higher circles of governments and international financial institutions. OLPC was first proposed at the World Economic Summit at Davos, a venue where geeks are very little in evidence. What Nicholas Negroponte ignored was the potential constituency that could have provided a workable counterbalance to Microsoft’s economic power. That would be the teachers, and ultimately the parents, of the children in whose name the work is being done. The opposition I have expressed was based on Nick’s rejection of this constituency, with OLPC’s embrace of Constructivism and its disparagement of any direct involvement by teachers. The software work (and the hardware work, certainly as manifested in the display) that has been done on the OLPC laptop has been excellent - a necessary break from the bloatware-driven designs of the past (and thus a threat to Microsoft’s way of organizing the world). If OLPC is to drift off to find its berth in the Microsoft world, we need to make sure that this work does not go with it to the exclusion of other possibilities. Organizations in target countries, such as OLPC Nepal, who are doing the necessary curriculum development work in spite of Constructivist ideology, should be supported however possible in building upon the software base. Their work will yield fruit among the constituency of educators and parents, and it is they who will be responsible for the success of the idea of making inexpensive computers widely available for education and community economic development. What is the status of the code base currently developed for OLPC? Is it accessible and freely available to be used by others? Someone closer to the project should make sure that this code base cannot be appropriated and kept from use by others. If the XO machine becomes unavailable to those who develop external software for it, then a replacement platform should be designed. This isn’t the hard part – the foundation of the project will be the software, especially the application software. I would recommend that a substitute platform for software development be specified and made available. A realization that led me into what became the personal computer area was that politics is exercised by control of information channels. Fortunately, there is OLPC News to provide an alternative to the official channels of OLPC, and there need to be more, especially serving the needs of software developers who pursue the OLPC vision. The historical fable we have laid out above has several possible endings. Throughout most of human history the revolution was crushed and survived only in literature and folk culture. In recent times, however, due to advances in the democratization of technologies (primarily weaponry and communications), people at the lower levels of society have been able to resist the counter-revolution and build a society that can defend itself. The only weaponry in our version of the fable is the software technology we all use. Life and death are not at issue, thankfully, but what is at issue is our understanding of who we are and what we can make happen. In the Book of Exodus, Moses was the charismatic leader who held the Israelites together for forty years as they wandered in search of the Promised Land. When the time was at hand to enter this land, Moses was prevented from entering with his people. Biblical scholarship tends to agree that this was not incidental, but constitutes a warning against turning over the community’s judgment to charismatic leaders – beyond a point. Perhaps this is the point at which the community of developers who follow the vision of OLPC need to begin the process of breaking from the direction of the charismatic leader, and begin to realize their own potential to lead in necessary areas. We have the technology to do so. > cannot be appropriated and kept from use by others. their knowledge to prevent such mistakes). "Did anyone really believe that Microsoft would confine its opposition activity to disparaging commentary? Any regional manager of theirs who did not work frantically behind the scenes to apply pressure on target governments to block acceptance of OLPC as originally designed would have found himself out of a job." Since the entire article is based on the assumption that the claim above is true, I would like to know what proof the author has that his asumption is correct. It seems to me that Mr Felsenstein is buying into the anti-Microsoft arguments, thus losing his grasp on a more-likely reality: the ONLY reason Negroponte has brought Microsoft into the picture is that the orders (1 million per country) are not coming in. Yes, he keeps throwing names around, but when everything is said and done, it is clear that PERHAPS Libya is the only country with some sort of formal commitment. 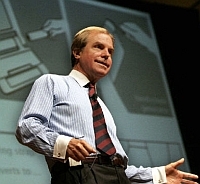 Microsoft's name, Negroponte thinks, will make his offer more attractive. what facts are there about how successful this counterrevolution has been so far? A) OLPC has fewer orders than expected but they still claim to have 2.5 Mio XO orders with sugar (not XP). However, not all orders are signed yet. B) OLPC has increased XO's HW spec for whatever reason. E) OLPC helped MS to port XP to XO. F) MS is offering a $3 SW suite based on XP. G) XO's mass production has been delayed somewhat for whatever reason. Are these facts correct? Can anybody disclose more important facts? Either the OLPC leader is too compliant or MS really has OLPC on their hook and they have to comply. 1) What is this hook? Quanta? AMD? Redhat? Some 3rd world education ministers? Some weakness inside OLPC? Why doesn't OLPC fight? With those 2.5 Mio orders they might still prevail. 2) Would another OLPC leader change OLPC's ability to defend or even attack? now instead of 1 laptop per child, it has become 1 laptop per 1.75 child. i simply don't get the idea of providing laptops to children of the third world when they still lack the basic needs - medicine, food, lodging... the money would be better used for something else, anyway, what use is a computer without internet? who is going to pay for their internet access? troy's scenario does not contradict any of the above facts (A-G). His assessment sounds plausible. However, some form of Lee's counterrevolution scenario might also have contributed to the low order numbers. in some place you can read that there will be internet. The countries pay a few cents (or 1$ ? I can't remember) per child and year for the internet access. Google will provide storage for each child for free AFAIK. The kids will also have email accounts. But I don't know who provides them. Help with education and food do not exclude each other. These have different time horizons. Food is short term help provided by different organizations. Education is long term help to prevent starvation in the future. Remember Confucius' proverb: Give a man a fish and you feed him for one day. Teach him how to fish and you feed him for a lifetime. "And the second part of your question is that very often, this appears in the press all the time, we get a question of this sort ..I mean I'm just going to illustrate it: "Why give laptops to kids who are dying of hunger, malaria, who don't have clean water?" The answer to that question is very simple, just substitute the word "education" for "laptop" and you'll never say it again. Because, clearly, if a child is dying of hunger that child needs food right then and there. Education is not on .. it's a separate thing. But when you solve and you address and you work on all of those problems nobody I know would say: "By the way, let's hold off on education." The reason you don't do that is because education happens to be a solution to all of those same problems." The Microsoft Empire Strikes Back? I was waiting for the part where Luke destroys the Death Star. Could we at least have a scene where Bill Gates tells Nick Negroponte he's his father? At the very least we have Quanta with clock stopping hot technology available to customers, a Linux based OS designed for children and the greatest achievement - attention on poor and third world education needs. Lee, thanks for complimenting OLPC Nepal. We have been working very hard to develop curriculum here and involve teachers. We also believe very firmly in the constructivist education philosophy. We do believe that teachers play a central role in constructivist and child-centered education. In our view, "constructivist" does not imply "no teachers." The Bottomline: We need an inexpensive tool to provide high-quality education to teachers and kids. 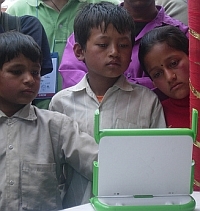 We at OLPC Nepal believe the XO is the appropriate tool at this time and could spawn a whole generation of tools that serve as inexpensive conduits for high-quality education. If MS and Intel crush OLPC, it will deprive a lot of kids and teachers here in Nepal and elsewhere. If you agree with what we are doing, please lobby, organize, and code to help OLPC. Also, OLPC has been very supportive of OLPC Nepal and our efforts to develop curriculum and teacher training. You guys are making a tempest in a teacup. I have already pointed out a few times, here, that Negroponte was talking about Windows as an option (but not from OLPC) on their machine as far back as April of 2005. I am pretty sure that he was thinking of Windows CE back then while with the upgraded specs Windows XPE will be possible. Other than that, nothing has changed relative to Microsoft or Open Source since the start of the project. I wouldn't be surprised if the various governments had been pushing for the XO to match the Classmate's specs (the press in Brazil has been making a big deal about the previous differences) but the most important reason for changing processors is that Python is so central to the software side of the project and a Geode LX700 will run that language twice as fast as a GX500 (more due to the L2 cache than to the clock increase). While MSFT on the OLPC itself is not new, the casual way in which OLPC leadership seem to say that its okay if governments wipe off Sugar/Linux for Windows is. In fact, it almost seems as if Negroponte doesn't care, as long as he makes his 3 million minimum order. That is a massive change from the original OLPC ideals.